If you are working in a lengthy manuscript and aren’t using Microsoft Word’s Navigation Pane tool, you are missing out on an easy way to track your progress or move around your document. 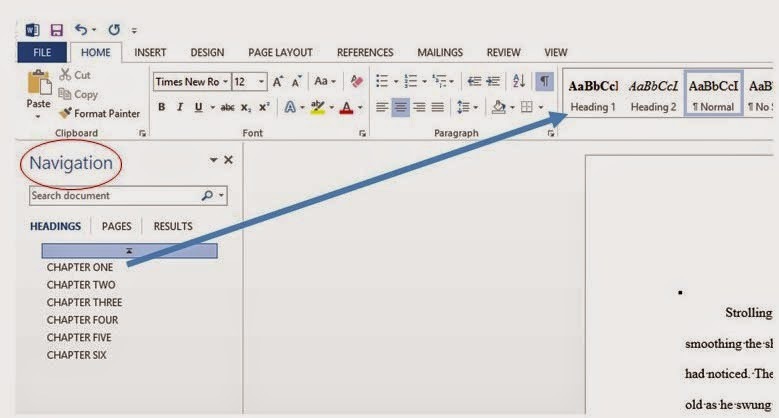 When you apply Word’s styles, the Navigation Pane allows you to look at the “skeleton” of your document. To move to Chapter Three, you click on those words in the side of your screen. Even if you use the default settings, if you apply subheadings (Heading 2, Heading 3), Word’s feature will nest them under the main heading (Heading 1). It’s easy to practice in a shorter document before applying it to the draft you are revising. First, type a few words on a couple different lines in your Word file. Highlight all the text on the first line and then click on Heading 1 in the Word ribbon at the top of your screen. If you’ve never changed the default, it will probably change your first line to a blue, 16-point font. Then repeat step two by highlighting the second line with Heading 2, Heading 3 on the third line and so on. You’ve applied styles to those various lines of text. Click on View and look for three check boxes [Ruler, Gridlines, Navigation Pane] in the Show field of the View tab. Click Navigation Pane so there is a check mark visible. What do you think you could use Navigation Pane for in your writing? Are there other Word tools that you’ve always wanted to learn more about? Elizabeth King Humphrey is a writer and editor living in North Carolina. She loves to teach people how to use Word to make their writing lives easier. THERE ARE MEN WHO BELIEVED OR BELIEVE THAT WATER BAPTISM IS ESSENTIAL TO SALVATION AND THERE ARE THOSE WHO REJECT THAT REQUIREMENT. THOSE WHO REJECT WATER BAPTISM AS A PREREQUISITE TO SALVATION. And all "Faith Only" preachers. Acts 2:37-38 Now when they heard this, they were pierced to the heart, and said to Peter and the rest of the apostles, "Brethren,what shall we do?" Peter said to them, "Repent, and each of you be baptized in the name of Jesus Christ for the forgiveness of your sins; and you will receive the gift of the Holy Spirit. All twelve apostles believed water baptism was essential to the forgiveness of sins. Ananias believed water baptism was essential to be saved. Acts 22:1-16.....10 And I said, 'What shall I do, Lord?' And the Lord said to me , 'Get up and go on to Damascus, and there you will be told of all that has been appointed for you to do'........12 "A certain Ananias .....16 Now why do you delay? Get up and be baptized,and wash away your sins, calling on His name. Ananias, a spokesman for Jesus, told Saul to be baptized to wash away his sins. The Apostle Paul believed water baptism was essential for the forgiveness of sins. Jesus, the Son of God, believes water baptism precedes salvation. Shall be saved does not mean already has been saved. If you are looking for answers about faith and practice of Christianity under the New Covenant, should you look to Ananias, the apostles, and Jesus or should your spiritual guidance come from men who deny that water baptism is essential to forgiveness from sin? Do you really want to follow the teaching of men who say you can be saved before you are baptized in water? THERE ARE NO DRY-CLEANED CHRISTIANS!